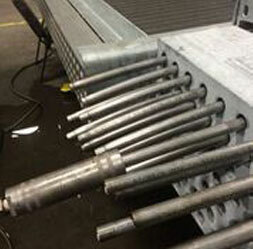 Curran installs full length exchanger tube liners to restore corroded tubes to service. Using a corrosion resistant alloy, corroded fin fan air cooler tubes can be returned to service using full length liners. Condenser tube liners can be installed on any exchanger that can be retubed in place, and should be considered as an option to a partial retube, or restoring corroded tubes in service. Using a hydraulic pump, the alloy liner makes intimate contact for a full length tube-in-tube repair. Curran can repair corroded exchanger tubes using a full-length tube-in-tube alloy liner that is hydraulically expanded to the existing tube. The high-pressure expansion makes “intimate” contact the full length and inhibiting tube ID propagated corrosion. This repair strategy is a cost effective alternate option to a complete bundle re-tube and an ideal repair strategy to maintain “fitness for service” parameters. Alloy tube liners offer a material upgrade to mitigate the effects of operating service corrosion on mild steel. Specifying alloy liners installed at the fabrication shop is a cost-effective value-added option for in-kind replacement exchangers. Full length liners can be installed in nearly any straight tube exchanger. Curran provides expert tube ID cleaning using a dry grit method that optimizes the installation and enhances thermal performance of the liners. Contact Curran for a turn key project estimate and see our animation of an air cooler tube liner installation job. Tube liners can be installed on corroded tubes at any location in the exchanger; the tube-in-tube repair focuses specifically on corroded tubes needing repair while leaving tubes fit for service unchanged. A complete condenser re-tube requires much ancillary repair work to the condenser, for example restoring support plates/baffles for new tube installation accounts for more than 50% of the total schedule. Full length liners are installed down existing (parent) tubes; tube ID girt blasting is recommend surface prep prior to installing liners. Full length liners can be installed in a fraction of the time compared to re-tubing.Repair liners can be targeted at tubes found with corrosion, installing a nominally smaller new tube to continue tube operation. Baffle obstructions are not a factor as they can be with re-tube. For tube ID propagated corrosion, the client typically chooses a more corrosion resistant material for use as a tube liner. Liners are mechanically roller expanded after hydraulic expansion to seal the installation. Curran can mobilize hydraulic pumps and tools globally to provide a turnkey tube cleaning and liner installation. A job QC form tracks existing dimensions of exchanger tube, verifies liner dimensions before and after hydraulic expansion, and offers random measures of mechanically expanded and sealed tube ends. 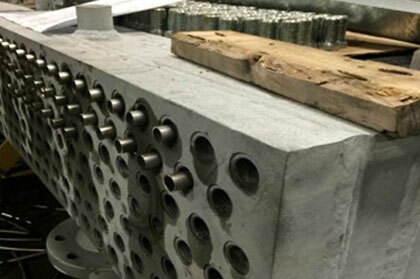 Tube material MTR is provided with tube shipment from mill. Contact Curran about its solutions for exchanger and condenser repair strategy.